See our Cerwin Vega diaphragms page for details. I bought two of these to repair my SWR Silverrado Special cabs. I had blown both high drivers playing some music through them for practice one night. I pulled the horns and replaced the drivers with these which are a perfect fit and I have back my total sound from my cabs. I bought one of these a few years back from a different website to fix the horn on my Bassman 200 (took the darn thing to a football field and cranked it back in my teens and blew it out, then again at a gig a few years later) and it works great. Hopefully I'll be mindful of the horn and attenuate it next time I blast it on full. 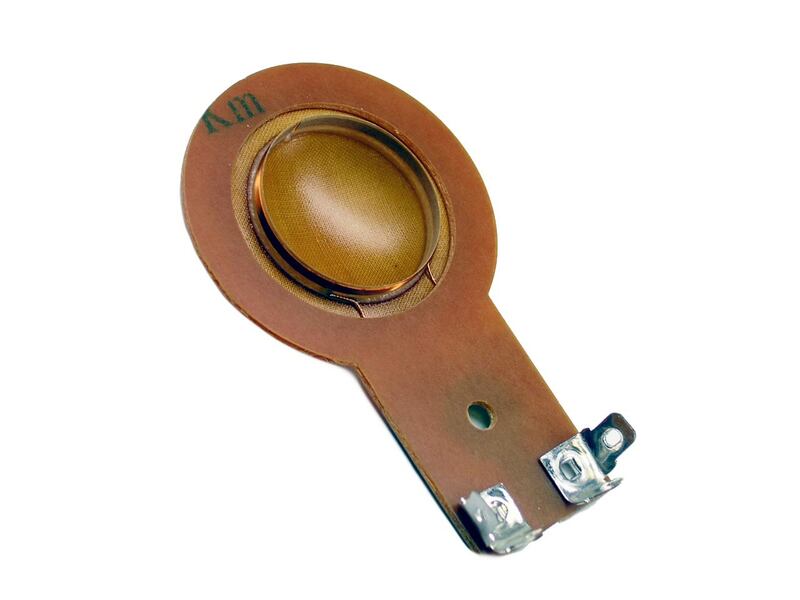 Was looking for a diaphragm for a 2 Soundtech horn drivers. Didn't know if these would fit. Got them in the mail. (Delivery was excellent. )And they fit like a glove and work well also. Actually had looked everywhere else on the internet a had trouble finding a diaphragm that fit. My horn drivers are vintage. The cabinets they go in a made of wood not the new plastic. Price was cheap enough too. . I needed to replace Diaphragm in my SWR Goliath 4-10 cab. After seeing very helpful video on how to do this, I ordered this unit. Received it in a very timely manner, replaced it, and I'm back in business working my show. Than you Simply Speakers.Well done. Works better than original part. Easy to install. great item. used in MANY brand name high end horn drivers. Thanks so much for carrying this item. They work perfect, and quick delivery. 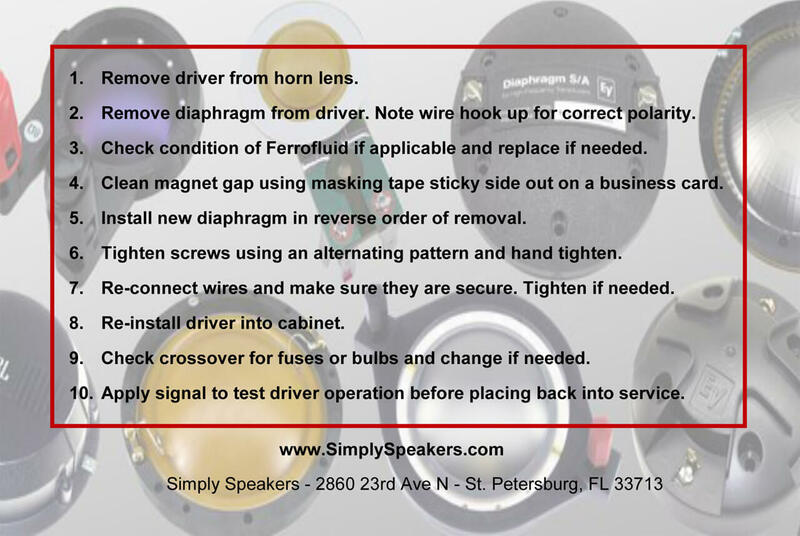 Q: Hi, the diaphragm I'm replacing is "025N30". That exact number is not in the list but all the measurements are identical. Think it will work? Thx. A: Yes, this diaphragm fits your model perfectly. Thanks! Q: This looks like the right diaphragm to fit the horn in my gallien krueger 410rbh/8. Can you confirm? A: Yes! This model fits the horn in your GK cabinet. Thanks! Q: I have horn which i believe the diaphragm is shot. There is no name brand, only model. EFD 40 980-002-018 8ohm 2734Z The diaphragm looks exactly like this. The only name visible is Eros on the outside of the horn If the size is the same, would this diaphragm work? A: We do not have data on your particular model, however, as long as the dimensions are the same, this unit should work. You can also email a photo of yours to us, and we can help you verify prior to placing an order. Q: Hello, I have a pair of Crate PE-12H that have blown tweeters. I can't find information on the 12H's anywhere. Do you know if these would fit? A: Thanks. Yes! 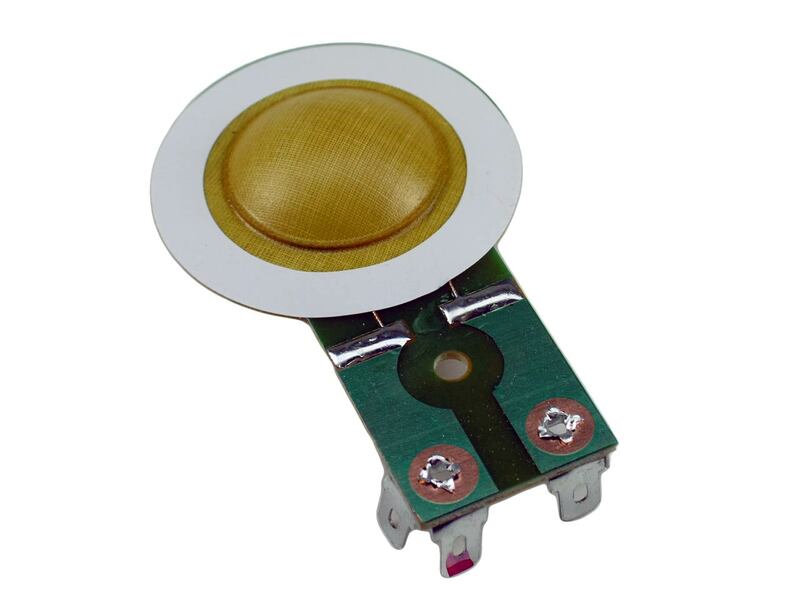 This diaphragm fits the HO25 driver used in the Crate PE-12H. Q: Have a foster 025n47 8 ohm will this fit it? looks like same one? A: Thanks! 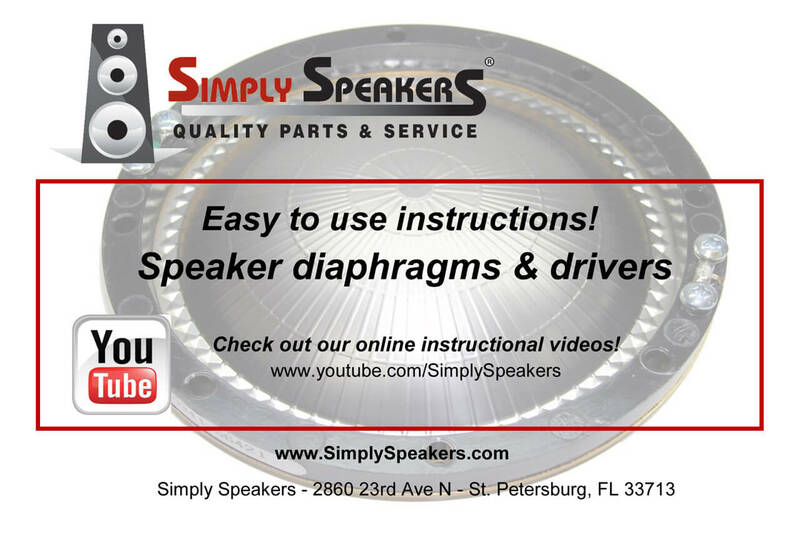 Yes, this is the correct diaphragm for your model. Q: Will this work for Foster 025N27? A: Thanks. Yes! This diaphragm fits the Foster 025N27 drivers.